I’m not totally sure how to start processing the fact that I am running the Baltimore Marathon in two days. I look back on my training: there were some hiccups, some moments of doubt, and I didn’t meet some of my short-term training goals. I barely ever ran pace runs. I struggled with getting my mileage above 30 miles a week for awhile. Waking up early to run on weekends will probably never come easy to me because it definitely did not this time. People who run marathons do this all the time: did we do enough? It doesn’t matter how many you’ve run because this always comes up. We ask that because we have different goals with every race. For me, I’ve had a goal since 2013 to run a 4-hour marathon. It certainly feels like I have trained enough to run one. My four half-marathons this past spring ranged between 1:58 and 2:05 finish times. I have consistently trained for a 9:06 pace and, on occasion, held that pace or faster for several miles at a time. My long runs have all been within long run pace range, although I admit that I am confused about how I will hold a 9:06 average pace over 26.2 miles when I have trained consistently within 60-90 seconds slower than that. Not sure how to explain that one. 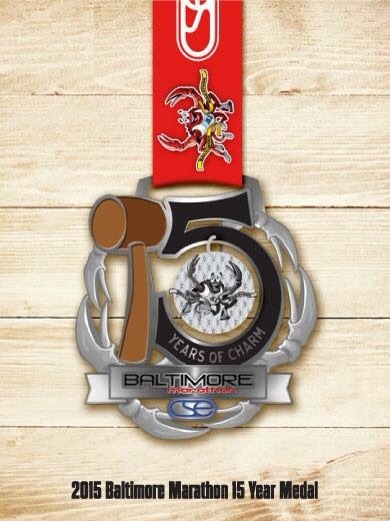 Here’s my prediction for the Baltimore Marathon: I will run either a 4:15, 4:20, or 4:25. A 4:15 is an average 9:43 pace. A 4:20 is an average 9:54 pace. A 4:25 is an average 10:06 pace. And just for kicks, a 4:30 is an average 10:17 pace. But my goal is to beat my 2013 marathon PR off 4:38, which I ran at an average 10:36 pace. I feel like that is completely possible. I have been training to beat that pace. I feel like this will be the race to finally put 2013 behind me. I think my strategy will be to align with a pace group. I’m going to run with the 4:20 group and see how that goes. If I get faster, great. But as long as I stay ahead of 4:30. When I ran the 2013 Rock ‘n Roll DC Marathon, I ran with the 4:40 pace group and it helped me to stay accountable. Once in awhile, they got ahead of me. But toward the end, I barreled in front of them and I was able to finish about a minute and a half ahead of them. Unlike the Chicago Marathon, I will walk the water stops unless I am running a solid pace. I’m not going to walk for the sake of walking. But I’m not going to overlook the idea that sometimes a quick walk break helps to reassess and recover a bit. Baltimore is a hilly course, so I will take the uphills slowly and conservatively and regain my pace on the downhill. This will be especially true in the beginning part of the race when it’s uphill for a little while. Besides, I’ve found that I usually rock the uphills. Every now and then during training, on the long runs, I lost my mental vim and vigor long before my run was done. I got crabby and cranky and annoyed, as I usually do when I get tired. It’s hard, when you’re at mile 20, to look back and say, “I just ran 20 miles!” because all you can think about is, “I still have 6 miles left!? !” The marathon is not just hard for the running; it’s hard on the mind. But I’ve found that this happens less so in races where there is course support and you’re with other runners. It also helps to have a killer playlist. I ran the entire Run for the Ranch Marathon in 2013 listening to 90’s music. I have to remember that I trained for this. I tailored my training around this hilly course. I will run this course; this course will not run me. I just came back from 4 days at a work conference in Nashville where I was on my feet nearly the entire time. Honestly, I’m feeling a little tired and achy from that. My hips hurt and I probably couldn’t get enough yoga if I tried. I took Thursday and Friday off work to stay off my feet, hydrate, carb up, and rest so I’m hopeful I will be just fine. It probably helped me to be on my feet– I didn’t get much running done. I did get between 7 and 9 hours of sleep every night. That’s critical. The night before a race is usually a joke when it comes to sleep. Out of the 5 marathons I have run, I think I only slept well the night before one of them. The week leading up to the race is the most important for sleep. I will probably only drink enough caffeine to ward off a headache so I can take frequent naps. I’m having trouble carbing-up. This is the STUPIDEST complaint in the world but I am not hungry enough to eat as many carbs as I need for this race. Plus, you know how you feel when you eat too much pasta or after a donut or something? I have to kind of push past that feeling of grossness. I’ve been mindful of getting carbs when I can: two dinners that included mashed potatoes, fried rice for lunch one day, breakfast consisting of several blueberry muffins, two pasta meals. A beer. I started carb-loading on Monday, but when I jumped on the scale when I got home, I’d only gained about 2 pounds. Usually the week of a marathon, I swell up by 5 or 6 with all the carbs and water that I consume on top of virtually no exercise. With two days before the race, I need to get creative and aggressive. So far, the weather seems like it will be just as predicted: A high of 57 and a low around 39. It’s possible the first frost will occur. That is seriously splendid weather for running. This is hopefully where all my runs in 90+ degrees will pay off. As long as wind and rain are not forecasted, I’ll take it. The weather is obviously always the first thing on runners’ minds because have to decide what we’re going to wear. On deck, I have a pair of Oiselle shorts that I will very likely stick with regardless of weather predictions. I also have a charcoal gray Champion tank, a sea green pair of Saucony arm warmers, and black compression socks. I also have gloves that I can throw away and I’ll probably be wearing a throw-away fleece jacket and, if I can find them, a cheap pair of sweat pants. 39 seems really, really cold. If the weather is going to be that cold, I will also need something to cover my ears because my ears are pretty sensitive and freeze pretty quickly. I may go with a hat or headband. I am unsure about the tank at this point because I tend to stay pretty cool when I run. I am nervous I will stay cold throughout the race. Maybe that will help me run faster, maybe not. If I decide not to wear it, I’ll have on a black Under Armor t-shirt. You know, since we’ll be running right past them on the race course. Am I nervous for this race? A little, yes. I just don’t want to bonk out. I’m not really thinking about the fact that I have another marathon in 10 days either. I decided to run my heart out at Baltimore and run for the experience at Marine Corps. I have to remember why I do this: because I need something to do that doesn’t make me feel like my life is an endless string of unknowns, of wasted love, of fruitless labor. Running marathons is the one thing I can do that is as much up to chance as it is dependent on my hard work. And I’m really excited to see what I can do. I would still take 95 degrees over winter running any day! Pretty sure I live in the best city on the planet. What this photo didn’t capture: my Old Navy shorts riding up front and my off-brand tank riding up with every step. Looking at this picture, I feel so blessed to be right here. This run brought to you by old school Celine Dion. Hey– when you need to run slow, you need slow jams to keep you on pace. 20 miles in the pouring rain.